But then the words….10 calories burnt to produce 1… I was intrigued, and completely Nerd Sniped. If physicists are 2 points and mathematicians 3, then I am pretty sure someone added nearly a point to their total for me. I am still searching for the actual research to document that claim. It certainly reverberates loudly in the echo chamber that is social media. (see also: “Irony“) The figure is a staple of Michael Pollan’s lectures, and gets repeated in blog posts ad infinitum, sometimes along with the claim that, historically, 1 calorie of input resulted in 2.5 calories of food produced….which I suppose was true when we were hunter-gatherers. Onward through the bibliographies and footnotes of research papers I fall, papers that increasingly advocate for population control, or even forcible population reductions along with the lament that such an idea is “unpopular”… You reckon? And it is also a trip back through time. Research from 2005…2001…1996…1989…1986 (Imagine these numbers spinning by on your screen like some TV sitcom flashback sequence…) 1980…1973 (!) Can it be that today’s energy use in agriculture figures contain the embodied energy calculations for various inputs such as machinery and fertilizer from 30 years ago? And who is this “we”? All of agriculture? U.S. agriculture? “Industrial ag”? What? And how many calories are produced? By who? All of ag? Who? This year (2014) the U.S. corn grain yield is projected to be over 14 billion bushels. That adds up to about 1,022,000,000,000,000,000 calories. (A discounted total that takes into account the amount of energy needed to get rid of the water that is 15.5% of corn grain.) That number is unwieldy to type. Thankfully, there is a much handier equivalent unit we can use for such large amounts of energy: the “quad”, or quadrillion BTU. That big number of corn calories equals about 4 quad. (4.0524966141665, but who is counting.) No matter what units you use, that’s lots of energy just from the U.S. corn crop. Total energy consumption in the United States for 2011 was 97 quads. Lets make life easy and assume that for 2014 is will be an even 100. (Or, 101.312415354, to make the math super easy…) That would mean that for every 25 calories of total US energy consumption, 1 calorie of corn grain was produced. And, of course, agriculture is not the only thing that the US consumes energy for, and corn is not the only product. And, true, all corn does not go into “food”, but “agriculture” produces more than just “food”, yet all of agriculture’s energy use is attributed to food production. Double entry accrual accounting this is not, and it seems that this 10:1 ratio is patently absurd. The real number is out there, and the methodology to calculate it is interesting to ponder. 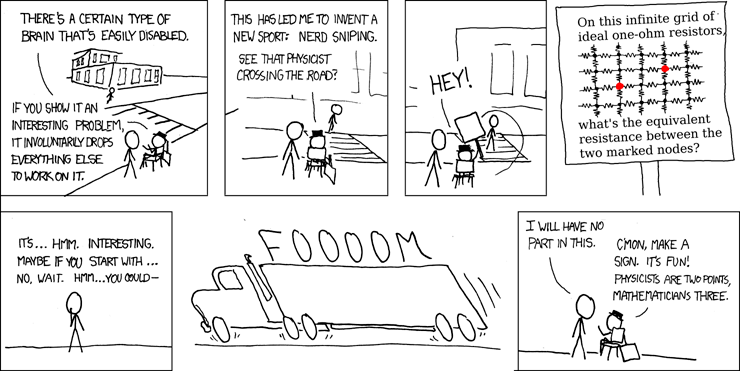 With luck I will Nerd Snipe someone and they will arrive at the answer…. But perhaps all of the above misses the point. Lets say the 10:1 figure is exactly correct…. Aside from agriculture, how many other endeavors produce any calories with the calories of oil that they consume? Beancrusher is like that weirdo who graduated high school a few years before you did, but still hung around acting like he was still in school. Follow him on Twitter and see if you can disable his brain too.